By coincidence two quite different processes are dramatising simultaneously the market shocks now being applied relentlessly to the NHS. Sir Bruce Keogh, the NHS clinical director, is demanding that hospital closures must be accepted in order to concentrate scarce specialist skills ‘for the good of the patient’. The buzzword for this latest upheaval is “reconfiguration”, and of course it is said that cuts have nothing to do with it. Over the last weekend some big names in the medical profession were drummed up to explain to us peasants that the doctors, consultants and specialists recognised that there needed to be wholesale reshaping of the NHS estate and the politicians should keep out of this and leave it to the technocrats who know best. No mention of patients of course or of the general public who are the recipients of the service and ultimately pay for it. It’s true that some district general hospitals are not in the most ideal location, though strenuous efforts were made to deal with this in the enormous PFI building programme of the Blair/Brown era. Having almost doubled the NHS budget through this colossal bricks-and-mortar reconstruction programme, we are now told there must be a major shift away from hospitals towards preventive and community services. In principle this is certainly sensible (as it also was a decade ago when the PFI building projects were all the rage), but it would be disingenuous not to admit that this is now driven by cuts. PFI ticked the Blair boxes in the 2000s and now cuts tick the Tory boxes in the 2010s, despite the latter being a U-turn reverse from the former. Then something else happened just as the politicians and the public – hopefully injecting some democratic impulse into the NHS – were being told to get out of the way. The South London Healthcare NHS Trust went bankrupt because of the overload of PFI debts, and the administrator then demanded, on the basis that the government would provide no more money so that other local hospitals would have to take the strain, that the A&E and maternity units at the prospering local Lewisham hospitals should be shut. In other words, the profitable emergency and maternity patients at the high-performing, solvent and popular local hospital are to be diverted to keep afloat a distant bankrupt trust losing £65m a year. Under this proposal mothers in Lweisham will now have to travel to the Queen Elizabeth in Woolwich which takes over one and a half hours on 3 separate bus rides. 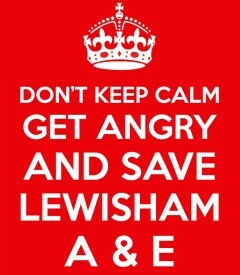 The explosion on Saturday, with a march of 25,000 irate residents through Lewisham, is set to resonate through the NHS countrywide. There 60 other trusts balanced on the edge of insolvency. Planning from on high by the bureaucrats plus massive cuts and the PFI follow-through for which there is no electoral mandate, are a toxic mix which is set to reverberate over the next months and years and which neither the bureaucrats nor the Tories are likely to be able to control. Posted in: Conservatives, Health, Politics, Social Affairs. Correct me if I’m wrong but I believe the NHS horse has already bolted!! I believe the Health & Social Care Act killed the NHS. Well maybe in England of course in Wales we are just closing hospitals. Yes the Health & Social Care Act did indeed bring the NHS to an end but there is now an epic struggle to be had defending local hospitals and trusts against the cherry-picking, asset-stripping private health service providers who are skimming 20% off our National Insurance Contributions away from front line services to pay fat cat executive salaries and dividends for their corporate shareholders. There will also need to be an epic struggle against the coming means testing of all health service provision that both the Coalition and New Labour are preparing the way for. Not a shot was fired by the Labour and trade union bureaucrats against the termination of the NHS but ordinary workers are feeling the effects now. Occupations and commitees of all grades of staff that can challenge for management of hospitals and trusts is the way forward. sadly Labour under Blair gave the Tories all the ammunition it needed if it needed anything. But where is Miliband on this not sure.